In June of 2008, at the age of 17 years old, our mare Caro TOF (AHR A CN 24422) gave birth to a filly out of our two-time AHR ‘National Champion Stallion’ and three-time AHR ‘Stallion of the Year’, Arno van het Nieshof. This filly’s AHR registered name is “Cashmere of Genesis”. However, when we first laid eyes on this little girl at less than 24 hours of age, John quickly dubbed her with the barn-name of “Guernsey” because she looked just like a little calf with the biggest eyes that we’d ever seen on a foal and a splash of white centered on her forehead. The name “Guernsey” stuck and although not very flattering, it fits this filly’s giant expressive eyes and independent personality quite well! Guernsey made her first show ring debut at the AHR National Futurity in September 2008. We had weaned her from Caro at only 3 months of age, about one week prior to the show, and so we weren’t quite sure what to expect from this filly on her first excursion away from home, much less into a show ring. But, true to the genuinely quiet and willing personality of the Arno offspring, she took everything in stride. 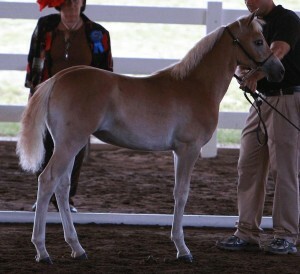 In the junior weanling pleasure filly class at the 2008 AHR Futurity, Guernsey won 1st place and later went on to be named the Reserve Junior Champion Pleasure Weanling. She was placed in reserve only to our 1st place junior weanling colt, “Antourage of Genesis”. At the AHR National Show in the Open Weanling Filly division, Guernsey won 1st place against all the other weanling fillies! This accomplishment was really remarkable for a three-month-old foal that was likely the youngest competitor in the class. If that is not enough though, Guernsey went on to be named the Reserve Junior Champion Filly of the open division!! Once again, not too modest of an accomplishment for such a young lady that only left her dam’s side the weekend prior to the show! In early October 2008, Guernsey attended the GLHA Futurity in East Lansing, Michigan. Guernsey won 2nd place in the Junior Weanling Filly Class. She also placed 2nd place in the Service Stallion Invitational Class, just behind her best friend and brother, Antourage. Together the Genesis Farm foals won 1st and 2nd place in the class on behalf of their sire, Arno. Once again, Arno’s offspring represented him well. Finally, in late October 2008, Guernsey competed in the Ohio Jackpot Weanling class held at the Ashland County Fairgounds in conjunction with the AHR Fall Sale. The Ohio Haflinger Association sponsored this weanling show and the foals were placed according to the averaged input of three separate judges. Once again, our Guernsey performed well for Genesis Farm, earning her second place in the weanling filly class! At less than 5 months of age, this was a very respectable finish. The complements for this young filly from spectators were numerous and she was a prime example of what we strive to breed for at Genesis Farm. With heavy hearts, after the 2008 show season, we sold our special baby Guernsey. Guernsey has been sold to the Cornman family from Pennsylvania. They have reported to us that Guernsey has quickly bonded to them and is the center of their two daughters’ attentions. We wish them the best of luck with Guernsey in the future at the shows in both halter and performance. She is a special filly that should make a name for herself and their family within the haflinger breed and as an ambassador outside of it.